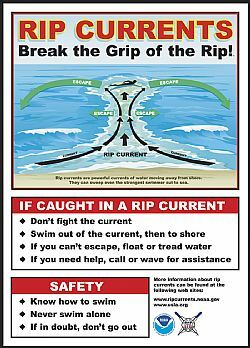 Be safe... Be aware of rip currents this summer! Gulf Coast beaches are great places to relax and to swim in the Gulf of Mexico. But before taking a dip, beachgoers should be aware of rip currents. According to the United States Lifesaving Association, rip currents are the leading surf hazard for beachgoers and can occur at any beach with breaking waves. The association says swimmers should avoid areas that show signs of rip currents, which include a channel of churning, choppy water, an area with a notable water color difference, a break in the wave pattern and a line of foam, seaweed or debris moving steadily out to sea. While some beaches have lifeguards, not all do. If a swimmer is at a beach with no lifeguard on duty and gets caught in a rip current, the Association has a few tips to keep in mind. Don’t fight the current. Swim out of the current in a direction following the shoreline or float and calmly tread water until out of the current. Once out of the current, swim towards shore. If unable to reach shore, draw attention and yell for help.